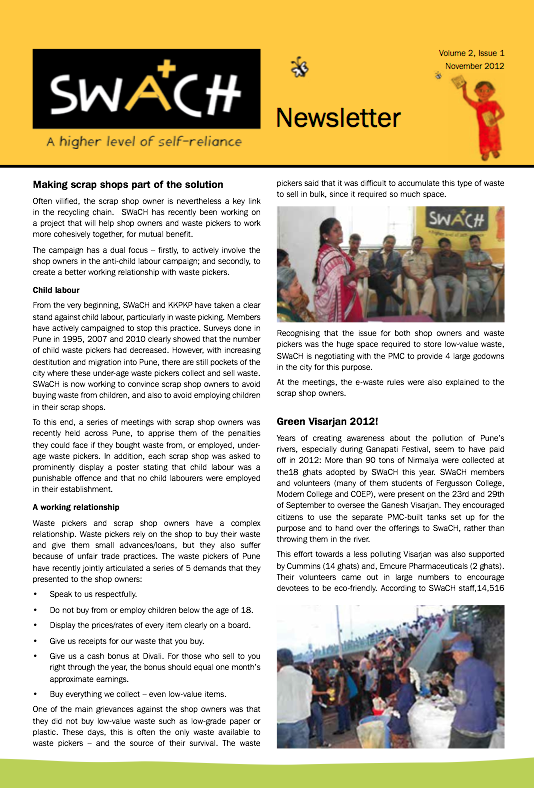 Check previous newsletters at SWaCH site. Often vilified, the scrap shop owner is nevertheless a key link in the recycling chain. SWaCH has recently been working on a project that will help shop owners and waste pickers to work more cohesively together, for mutual benefit. The campaign has a dual focus – firstly, to actively involve the shop owners in the anti-child labour campaign; and secondly, to create a better working relationship with waste pickers. From the very beginning, SWaCH and KKPKP have taken a clear stand against child labour, particularly in waste picking. Members have actively campaigned to stop this practice. Surveys done in Pune in 1995, 2007 and 2010 clearly showed that the number of child waste pickers had decreased. However, with increasing destitution and migration into Pune, there are still pockets of the city where these under-age waste pickers collect and sell waste. SWaCH is now working to convince scrap shop owners to avoid buying waste from children, and also to avoid employing children in their scrap shops. To this end, a series of meetings with scrap shop owners was recently held across Pune, to apprise them of the penalties they could face if they bought waste from, or employed, under- age waste pickers. In addition, each scrap shop was asked to prominently display a poster stating that child labour was a punishable offence and that no child labourers were employed in their establishment. Do not buy from or employ children below the age of 18. Display the prices/rates of every item clearly on a board. Give us receipts for our waste that you buy. Give us a cash bonus at Divali. For those who sell to you right through the year, the bonus should equal one month’s approximate earnings. Buy everything we collect – even low-value items. One of the main grievances against the shop owners was that they did not buy low-value waste such as low-grade paper or plastic. These days, this is often the only waste available to waste pickers – and the source of their survival. The waste pickers said that it was difficult to accumulate this type of waste to sell in bulk, since it required so much space. Recognising that the issue for both shop owners and waste pickers was the huge space required to store low-value waste, SWaCH is negotiating with the PMC to provide 4 large godowns in the city for this purpose. At the meetings, the e-waste rules were also explained to the scrap shop owners. 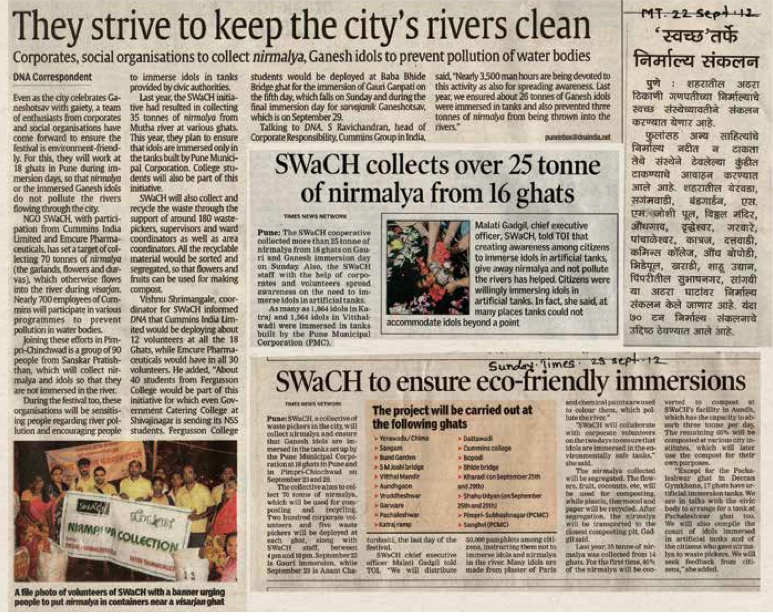 Years of creating awareness about the pollution of Pune’s rivers, especially during Ganapati Festival, seem to have paid off in 2012: More than 90 tons of Nirmalya were collected at the18 ghats adopted by SWaCH this year. SWaCH members and volunteers (many of them students of Fergusson College, Modern College and COEP), were present on the 23rd and 29th of September to oversee the Ganesh Visarjan. They encouraged citizens to use the separate PMC-built tanks set up for the purpose and to hand over the offerings to SwaCH, rather than throwing them in the river. This effort towards a less polluting Visarjan was also supported by Cummins (14 ghats) and, Emcure Pharmaceuticals (2 ghats). Their volunteers came out in large numbers to encourage devotees to be eco-friendly. According to SWaCH staff,14,516 idols were immersed in tanks on the final day, with Katraj notching the highest number – 2566 idols and 8 tonnes of Nirmalya collected on Anant Chaturdashi. The collected Nirmalya was sent for composting to Bal Kalyan, the Blind Schools of Kothrud and Koregaon Park, DSK, Katraj compost pits and SWaCH-maintained pits on Aundh ramp. Compost will be ready in about two months. The compost in Aundh will belong to SWaCH and will be used for generating further awareness about the importance of composting. The five SWaCH members — Saru Waghmare, Pushpa Shendge, Shobha Bansode, Kanta Shinde and Sudamati Kamble — looked resplendent in their gold and green saris as they confidently faced the audience on Sunday November 4th and launched into the song ‘Aamhi Swachateche Varkari’ – one of four songs that they presented. The audience, comprising SWaCH members, their families and supporters, had gathered in Mazda Hall for an innovative and one-of a-kind event – activist songs by SWaCH members, classical piano music by American pianist Kimball Gallagher and percussion by Agneya Chikte, of Taal Inc.
She added that they had been practising rigorously over the past many days with Alka Pavangadkar. Kimball Gallagher is a classical pianist who travels the world performing, linking up, wherever he can, with a humanitarian cause. In India, he linked up with waste picker organisations and performed with and for them in four different cities – Mumbai, Bangalore, Pune and Delhi. In each city, Kimball also learned the story of one waste picker and composed a short piece of music specially based on this story. In Pune, he based his composition on Abhijit Khandagle, the son of a waste picker and SWaCH member, who now works for waste pickers’ rights. Addressing the audience, Abhijit spoke of how inspiring he found his mother’s story, the back-breaking work that she had done to keep her children in school and her determination to see them secure their futures. Abhijit said that it was her courage that made him want to work to ensure that the children of other waste pickers also got a chance at a better life. Kimball explained the process that he went through to compose the music, and how he related the letters in the person’s name to a musical note. This was of great interest to the audience, many of whom were seeing and hearing a piano for the first time. Later, he also played Beethoven’s ‘Moonlight Sonata’. Kimball chose this piece, he said, because in its sparse use of notes (only three notes played 268 times) he was reminded of the frugal and careful way that waste pickers collected, recycled and used resources, with as little wastage as possible. 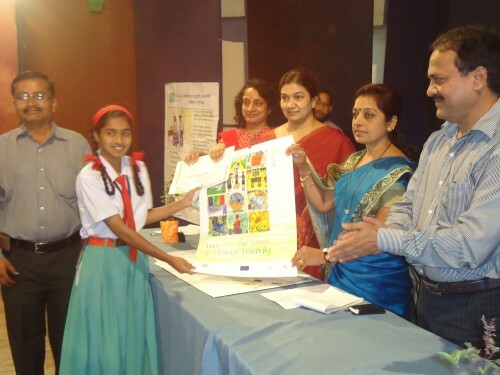 SWaCH recently organised a school poster competition on the theme: ‘How can we make our school an e-waste friendly place?’ On October 6 2012, the students who drew the three winning entries were felicitated at a ceremony co-organised by Pune Municipal Corporation (PMC), SWaCH and Deutsche Gesellschaft fur Internationale Zusammenarbeit (GIZ) GmbH Indo-German Environment Partnership (IGEP). Hon. Mayor of Pune Mrs. Vaishali Bankar was the Chief Guest. The best creative entries have been made into a colourful and informative calendar. This project to raise awareness about the issue of e-waste and find practical solutions at a local level, is being implemented by GIZ in 4 cities across India. SWaCH Pune Seva Sahakari Sanstha is the implementing agency of the project in Pune. Schools are encouraged to place a collection bin on their premises where small e-waste items (CDs, cell phones, cables, etc.) can be dropped. On its part, SWaCH will conduct Awareness Programmes in schools, and will also take the initiative to collect e-waste and send it to authorised recyclers. Schools interested in joining the campaign for a safe e-waste collection system can contact SWaCH at 9765999500 and 9765999501. Pratibha Bhosale lives in Yerawada and works in Sangamwadi as a SWaCH pratinidhi. She has been with SWaCH for the past 5 years. Sadly, Pratibhatai’s husband passed away while her two children were still small and she is now the sole bread winner of the family, supporting her children and in-laws. She says that her job with SWaCH, a cooperative of waste pickers and urban poor, has added stability to her life. Pratibha appreciates the proactive stance that SWaCH takes towards education – Kagad Kach Patra Kashtakari Panchayat, the waste pickers’ trade union, gives scholarships, interest- free loans and free copy books and stationary to encourage members to educate their children — but she rues the fact that the monetary aid is dwindling as the union membership increases. She wishes that some way could be found to increase the scholarships and financial aid for students, so that her children, and those of other waste pickers, can study further and in good institutions. Like most SWaCH and KKPKP members, a stable and secure future for her children and a secure old age for waste pickers like herself, are the dreams that Pratibha Bhosale wants to see realised. Sangamwadi: Ram Society in Sangamwadi is a society with about 511 flats, where citizens did not segregate waste, despite repeated requests. A meeting was recently held with society members, where Dr Bhende and the corporator Sunil Gogale explained the importance of segregation to the residents. But the next day, although some civic-minded citizens did remember to segregate the waste, most just handed over mixed waste again! When alerted to the situation by SWaCH waste pickers, Dr Bhende threatened to bring the overflowing container into Ram Society and keep it there so that the residents could enjoy the stink they were contributing to. He was supported by those residents who had started segregating waste. The ploy was effective – and thankfully did not have to be carried out: From the very next day, the waste pickers started receiving clean, segregated wet and dry waste. A similar scheme has also been successfully launched in a low income housing community of Wanowrie. a major disincentive to the waste picker who would also leave out the houses where she did not get paid. With no effective collection, the ground in front of the vasti was littered with filth, a breeding ground for disease. Recently, a meeting was held in the vasti with residents, the corporators, Dr. Bhende and SWaCH, and the benefits of a regular waste collection system were pointed out. Some residents agreed to support SWaCH and with their participation, a system was evolved, which has proven successful: The waste picker now collects segregated waste from all 300 houses, while the user fees are collected separately from as many houses as possible every month. Regardless of the amount collected, the waste picker is paid a fixed sum before the 10th of every month. This regular, assured payment has been a big incentive to the waste picker. Kondhwa and Wanowrie: Following a statement made by the Kondhwa-Wanowrie Mohalla Committee blaming SWaCH waste pickers for the fact that citizens do not segregate waste, waste pickers in that area have decided to stop accepting mixed waste. The waste pickers say that despite repeated requests to residents to segregate wet and dry waste, citizens have not made any serious effort to segregate waste so far. From August 9 onwards, since the waste pickers have started a segregation awareness drive in different areas, the societies have started engaging tempos to take away the mixed waste for dumping at various sites on the city’s outskirts. But the local Mohalla Committee which is so quick to point a finger at waste pickers, has had little to say about this dangerous practice, or about how these growing heaps of mixed waste are to be tackled in the future. They also remain silent on the fact that waste pickers have lost contracts to various societies still giving mixed waste. The habit of waste segregation is something that SWaCH, with the support of PMC, is trying to inculcate in Pune’s citizens, through segregation drives which are informative, fun, interactive and include visits by local corporators. SWaCH will be happy to provide advice and support to citizens’ initiatives on this issue. Tempo training has recently resumed in SWaCH! In the earlier training phase, nine trainees had successfully completed the course, while eight had dropped out along the way. As the new session was being planned, SWaCH staff visited some of those who had dropped out earlier, to try and understand their reasons for giving up the opportunity of learning how to drive. After some discussion, three SWaCH members from this group — Poonam Mahadeo Nade, Pratibha Shailendra Bhosale and Surekha Lala Gaikwad — opted to resume the training. While Surekha is still learning to drive, both Poonam and Pratibha now proudly show their permanent driving licences. SWaCH views the tempo training as an important option to offer women waste pickers and particularly, their daughters. The useful skill of driving a tempo is yet another way of empowering women waste pickers and preparing them for the future – those who have completed the training, speak of how their status in the community and home was elevated when they got their licences. Dr. Isher Judge Ahluwalia, former Chairperson of the High Powered Expert Committee on Urban Infrastructure and Services, was in Pune recently to study Pune’s waste management system. During her visit, she took a close look at the SWaCH model, visiting the Model Colony biogas plant, Bhosale Nagar sorting shed and Aundh ramp composting project. Dr. Ahluwalia interacted with SWaCH members Sunita Madhukar Kale, Madhukar Sadhu Kale, and Surekha Lala Gaikwad, amongst others. Dr. Ahluwalia beamed when she saw Sunita, her husband and son in the tempo they use for collecting waste, remarking: “Now, that’s a good model!” She spoke at length with the SWaCH team, asking them detailed questions. SWaCH Pune Seva Sahakari Sanstha Ltd. is a collective of self-employed wastepickers that provides waste collection and management services. It is authorised by the Pune Municipal Corporation.